stories of survival, of relations with American Indians, of the first Thanksgiving, and of religious freedom found, are the stuff of American legend. One of the cornerstones of the Pilgrim ethos is the Mayflower Compact. The Pilgrims were a small group of people bound by common religious beliefs. They did not believe in the influence over the church that the English king held, and preached separatism. This position did not sit well with the King, and by 1608, many of them left England for Holland, which was more tolerant of religious diversity. Though some of the group prospered, the time in Holland was hard. In particular, the group saw the children assimilating into Dutch culture, and they lamented the lack of opportunity to spread their interpretation of the Gospel to the far corners of the world. The leaders began to think about moving. The two main proposed destinations were Guiana and Virginia; there was also some thought of going to Dutch America, specifically to settle near the Hudson River. Eventually, though, financing was secured to pay for settlement in New England, an area north of the Virginia settlements. Two ships were hired for the voyage - the Speedwell, to transport the passengers, and the larger Mayflower, to transport cargo and to do exploration. The Speedwell turned out to be unseaworthy (reports arose that its crew sabotaged the ship to get out of their contracts), so the Pilgrims and other colonists brought in by the investors crowded into the Mayflower; about twenty passengers had to be left behind. The ship finally sailed for America in September of 1620. In November, the Mayflower spotted Cape Cod. They tried to sail south to the Hudson River, but turned back north when they encountered shoals. They anchored at Provincetown Harbor, at the northern tip of Cape Cod. 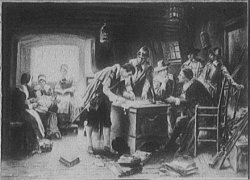 While anchored and awaiting exploration to find a suitable place for colonization, the colonists decided that their contracts with their investors were not valid, not the least reason being that the promised land grants for New England were incomplete (the grants were finalized while the Mayflower was in transit). The colonists decided to enact a contract among themselves. This contract, later known at the Mayflower Compact, is now seen as one of the first forays into democracy on the North American continent. In the Compact, the signers agree to bind themselves into a society to preserve order and to help further their aims. They agree to create offices, laws, and constitutions that will aid the common good. Finally, they agreed that such laws would be supreme and agreed to abide by them. In a nutshell, this is a classic embodiment of the Lockean idea of government (though it predates Locke), an idea carried on to what some consider its ultimate embodiment, the U.S. Constitution. The original Compact is lost to history, but its text was recorded in 1622 in a book about the Pilgrims and the founding of the colony at Plimouth (now Plymouth), Massachusetts. The book, entitled Mourt's Relation: A Journal of the Pilgrims in Plymouth, was published in London. This publication did not include the list of signers; this list is taken from another contemporary book, New England's Memoriall, published in 1669. The list is presented here in alphabetical order. All spellings in the original version are those taken from William Bradford's transcription from his book, Of Plimouth Plantation, written in 1645. The "modern" version was created by Steve Mount. Sources for the text: The Avalon Project and images of the Compact transcribed by William Bradford. Sources for introduction: The Plimouth Plantation website and Wikipedia. Having undertaken, for the Glory of God, and advancements of the Christian faith, and the honor of our King and Country, a voyage to plant the first colony in the Northern parts of Virginia; do by these presents, solemnly and mutually, in the presence of God, and one another; covenant and combine ourselves together into a civil body politic; for our better ordering, and preservation and furtherance of the ends aforesaid; and by virtue hereof to enact, constitute, and frame, such just and equal laws, ordinances, acts, constitutions, and offices, from time to time, as shall be thought most meet and convenient for the general good of the colony; unto which we promise all due submission and obedience.